Guardian Angel Araqiel – also known as one of the angels of earth. Firstly, his name means “Earth Of God”. And you can also find him under the names: Araquiel, Araciel, Arakiel, Arqael, Arkiel or Arkas. 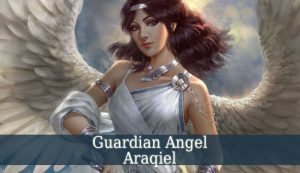 Guardian Angel Araqiel is usually mentioned as one of the fallen angels. But he also appears as a holy angle. Depending on the source of the information. Guardian Angel Araqiel, under the name of Arakiel is one of the angels with dominion over the earth. Therefore, he watches over every creature on earth. Arakiel has patron over the inhabitants of this planet’s lands, waters and air. This beautiful angel is very helpful in environmental activism and protection of rare species. Because every inhabitant of earth is the holy creation of God and must be protected. But he is only one of the 7 Holy Angels Of The Earth. The others are: Azriel, Admael, Arciciah, Ariel, Harabael, and Yabbashael. Araqiel is also mentioned as one of the five angels charged by God with leading souls for judgment. 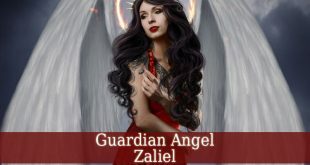 Therefore, Guardian Angel Araqiel, alongside with Ramiel, Aziel, Samiel and Uriel, lead all the dead souls to God and their personal judgment. Enoch I is the first source that describes Araqiel as a fallen angel. The prophet mentions him as one of the 20 “Watchers” who lead the 200 fallen angels. After falling to earth, he taught humans geomancy, or the “signs of the earth”. But the Sibylline Oracles depict him as a holy angel. These texts describe Araqiel as one of the five angels leading the souls to judgment. Due to the divers beliefs linked to Guardian Angel Araqiel, I don’t personally recommend praying to him. Being a watcher, means that he is very powerful, with dominion over other demons. Which idea makes him very powerful. But as a holy angel with dominion over the earth makes him a great guardian angel for anyone.